The role of the Spectroscopy and Biophysics Core is to provide instrumentation, training and support for any type of experimental work involving biophysical and spectroscopic measurements. Although most of the instruments listed below are configured for use in protein characterization work, the services that our core provides can be extended to partially purified proteins, whole cell assays and analysis of tissues. 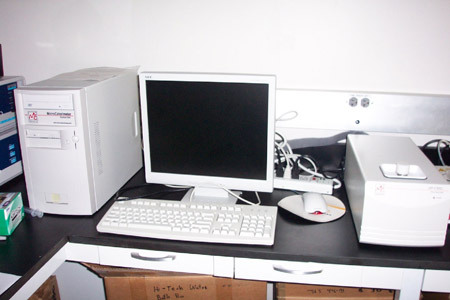 The instrumentation is located in rooms E155 and N113B of the Beadle Center and includes an Inductively Coupled Plasma Mass Spectrometer (Agilent 7500 cx), an HPLC with diode array detector (Agilent LC1200), a 96-well plate autosampler (Elemental Scientific Inc), a Stopped Flow rapid kinetics instrument (Hi Tech), a differential scanning calorimeter (Microcal GE Healthcare), a isothermal calorimeter (Microcal GE Healthcare) and a Spectrofluorimeter (Varian, Cary Eclipse). Determination of protein stability and thermodynamic parameters for protein conformational changes by means of differential scanning calorimetry (DSC). During a DSC experiment, the temperature of the sample cell and a reference cell is ramped up - usually in a linear fashion, and the difference in heat that is necessary reach that temperature is continuously monitored. The heat measurement is translated into enthalpies of transitions and heat capacities. 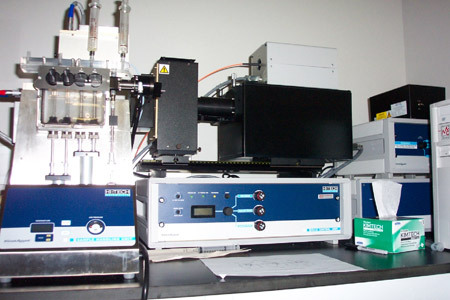 Microcal Differential Scanning Calorimeter and ancillary computer. Ligand-protein and protein-protein binding studies by means of isothermal microcalorimetry. A titrator syringe adds a concentrated solution to a sample of protein. The heat evolved or taken during the binding process or a chemical reaction is monitored at a constant temperature set by the user. After correction for heat of dilution of the titrant the enthalpy of binding can be accurately estimated. Studies at several temperatures allow the measurement of entropies and free energies ligand-macromolecule interactions and macromolecule-macromolecule interactions such and protein-protein and protein-DNA complexes. Hi-Tech Stopped flow showing the sample handling unit, monochromator, photomultiplier power supply and diode array detector. Standard Spectrofluorimeter equipped with up to 6 cuvets, a 96-well plate holder and a Peltier thermostated single cuvet holder for fluorescence, phosphorescence and chemiluminescence experiments in spectral and kinetic modes. Cary Eclipse Spectrofluorimeter with 96-well plate holder in place. Elemental Analysis by means of Inductively Coupled Plasma Mass Spectrometry. Almost any element of the periodic chart can be determined down to the parts per trillion (ng per kg or picomolar) concentration except C,H, O, N, F, Cl and noble gases. Samples can be as small as 100 microliters and can be in either liquid or solid states. An HPLC unit is coupled with this instrument which allow the separation of elements in distinct chemical environments (chemical speciation) or the reduction of interferences by reverse phase or ion chromatography. In addition, isotope ratio and spectral semi-quantitative analysis can be performed. 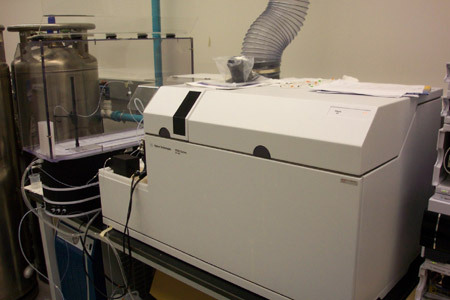 Agilent ICP-MS 7500cx with the autosampler. Analytical Ultracentrifugation. Determination of the protein quaternary structure of proteins using equilibrium analytical ultracentrifugation of protein solutions in water and deuterium oxide. NEW! JASCO CD spectrometer Model J815. 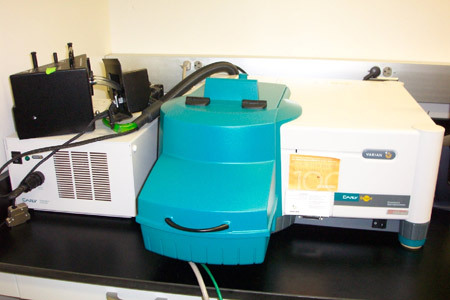 This spectrophotometer is routinely used to record Circular Dichroism (CD) spectra of Biomolecules in solution, but it can also be used for studies of protein, peptide and protein/ligand complex stability, rapid (stopped flow) conformational changes, fluorescence excitation and emission spectra, fluorescence-detected CD, fluorescence polarization/anisotropy and time and/or temperature dependent studies of these phenomena. The instrument is equipped with detection between 167 and 900 nm, monochromators for both excitation (polarized light) and emission, Peltier thermal sample holder (10 to 90 C) and a stopped flow for monitoring rapid CD-changes. Malinouski M, Kehr S, Finney L, Vogt S, Carlson BA, Seravalli J, Jin R, Handy DE, Park TJ, Loscalzo J, Hatfield DL, Gladyshev VN. High-resolution imaging of selenium in kidneys: a localized selenium pool associated with glutathione peroxidase 3. Antioxid Redox Signal , 2012, Feb 1;16(3): 185-92 [PubMed]. Malinouski, M.; Hasan, N.M.; Zhang, Y.; Seravalli, J.; Lin, J.; Avanesov, A.; Lutsenko, S.; Gladyshev, V.N. Genome-wide RNAi ionomics screen reveals new genes and regulation of human trace element metabolism. Nat. Commun, 2014, 5:3301 [PubMed]. Moxley MA, Sanyal N, Krishnan N, Tanner JJ, Becker DF. Evidence for hysteretic substrate channeling in the proline dehydrogenase and Δ1-pyrroline-5-carboxylate dehydrogenase coupled reaction of proline utilization A (PutA). J Biol Chem, 2014, 289:3639-51 [PubMed]. Zhao, H.; et.al. A multilaboratory comparison of calibration accuracy and the performance of external references in analytical ultracentrifugation. PLoS One, 2015, 10(5):e0126420 [PubMed]. Smith, N.; Wei, W.; Zhao, M.; Qin, X.; Seravalli, J.; Kim, H.; Lee, J. Cadmium and Secondary Structure-dependent Function of a Degron in the Pca1p Cadmium Exporter. J Biol Chem, 2016, 291(23):12420-31 [PubMed]. Hsieh, E-J. ; Waters, B.M. Alkaline stress and iron deficiency regulate iron uptake and riboflavin synthesis gene expression differently in root and leaf tissue: implications for iron deficiency chlorosis. J Exp Bot, 2016, 67: 5671-5685 [PubMed]. Moxley MA, Zhang L, Christgen S, Tanner JJ, Becker DF. Identification of a Conserved Histidine as Critical for the Catalytic Mechanism and Functional Switching of the Multifunctional Proline Utilization A Protein. Biochemistry, 2017, May 30 [PubMed].